Dr. Siddhartha Mitra has achieved the type of career that many young academics strive for. An accomplished scientist, professor, and mentor, Mitra credits his strategy of never letting opportunities pass him by—and the influence of his late academic advisor, Dr. Rebecca Dickhut—for much of his success. 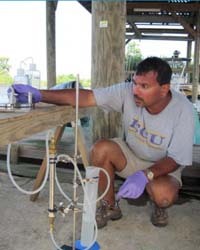 Now a Professor of Organic Geochemistry at East Carolina University, Mitra’s research focuses on the fate and transport of trace organic chemicals in the environment. As an organic geochemist, one of Mitra’s major areas of research is biogeochemical cycling of black carbon and its effects on the global carbon cycle—a topic he became familiar with during his post-doc at Tulane University. While at VIMS, Mitra’s research focused on sediment and pore-water distributions of a group of toxic and cancer-causing chemicals called polycyclic aromatic hydrocarbons (PAHs) in the Elizabeth and Hudson Rivers.